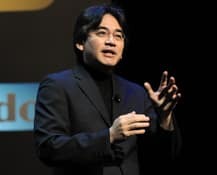 Nintendo CEO and President Satoru Iwata has unveiled that Nintendo 3DS fans will soon be able to acquire larger versions of the AR Cards through the Club Nintendo service in Japan. Such cards, whose smaller versions provided alongside the Nintendo 3DS console, allow you to produce 3D versions of classic Nintendo characters, as well as incorporating augmented reality mini-games. Iwata-san unveiled one of the larger cards during the latest Iwata Asks discussion, where he took a 3D photo of himself holding hands with his own Mii character (see below). It is believed that such cards will also make their way to both European and North American fans also.